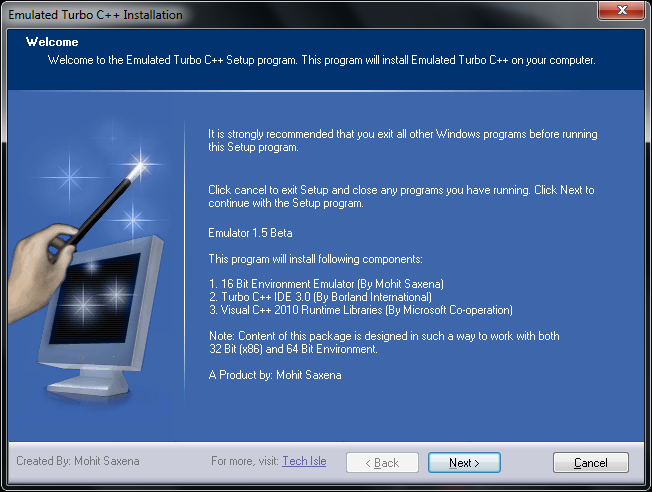 Turbo C++ for windows vista and windows7 64 bit, 32 bit. This software is designed to create an 16Bit environment on a 32 Or 64Bit machine. As 16 Bit environment is created, it allows to use any application designed for the architecture. Emulator has been designed especially for turbo c++ and thus ensures its smooth functioning. Now open the Emulated Turbo C++ from desktop shortcut. mediafire removed it... plz tell me how can i download it. Nice tutorial. Thanks for sharing the valuable info about c Training. it’s really helpful. Who want to learn c language this blog most helpful. Keep sharing on updated tutorials…..